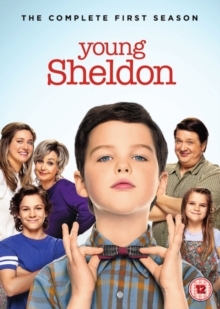 All 22 episodes from the first season of this comedy spin-off of 'The Big Bang Theory' starring Iain Armitage as a young Sheldon Cooper. The show follows the nine-year-old genius as he begins attending high school in East Texas but finds himself struggling to fit in with those around him. The episodes are: 'Pilot', 'Rockets, Communists, and the Dewey Decimal System', 'Poker, Faith and Eggs', 'A Therapist, a Comic Book, and a Breakfast Sausage', 'A Solar Calculator, a Game Ball, and a Cheerleader's Bosom', 'A Patch, a Modem, and a Zantac', 'A Brisket, Voodoo, and Cannonball Run', 'Cape Canaveral, Schrödinger's Cat, and Cyndi Lauper's Hair', 'Spock, Kirk, and Testicular Hernia', 'An Eagle Feather, a String Bean, and an Eskimo', 'Demons, Sunday School, and Prime Numbers', 'A Computer, a Plastic Pony, and a Case of Beer', 'A Sneeze, Detention, and Sissy Spacek', 'Potato Salad, a Broomstick, and Dad's Whiskey', 'Dolomite Apple Slices, and a Mystery Woman', 'Killer Asteroids, Oklahoma, and a Frizzy Hair Machine', 'Jiu-Jitsu, Bubble Wrap, and Yoo-Hoo', 'A Mother, a Child, and a Blue Man's Backside', 'Gluons, Guacamole, and the Color Purple', 'A Dog, a Squirrel, and a Fish Named Fish', 'Summer Sausage, a Pocket Poncho, and Tony Danza' and 'Vanilla Ice Cream, Gentleman Callers, and a Dinette Set'.